Home › Comic › Chicken Wings Classic – Too close for missiles. Switching to guns. Chicken Wings Classic – Too close for missiles. Switching to guns. Here’s a very special, very old strip for you. I think it was the second double-line Chicken Wings comic strip I ever drew. And when I think about how long ago that was, it makes me feel a bit old. It was before the F-14 was retired, which also was over ten years ago. By the way, personally I’ve never seen the F-14 in real life, be it at an airshow or anywhere else. I wonder how many of them still fly and if you can ever see them at a show somewhere. Does anybody know? Won’t see them flying. Were taken out of service and the F14 specific parts were collected so the Iranians could not get parts to fix theirs. Were an amazing platform. Other than the limited number the Iranians operate, I think there are only gateguards remaining. The broke up all the other airframes. F-18s were nice, and I always loved the sound they make as they flew by. 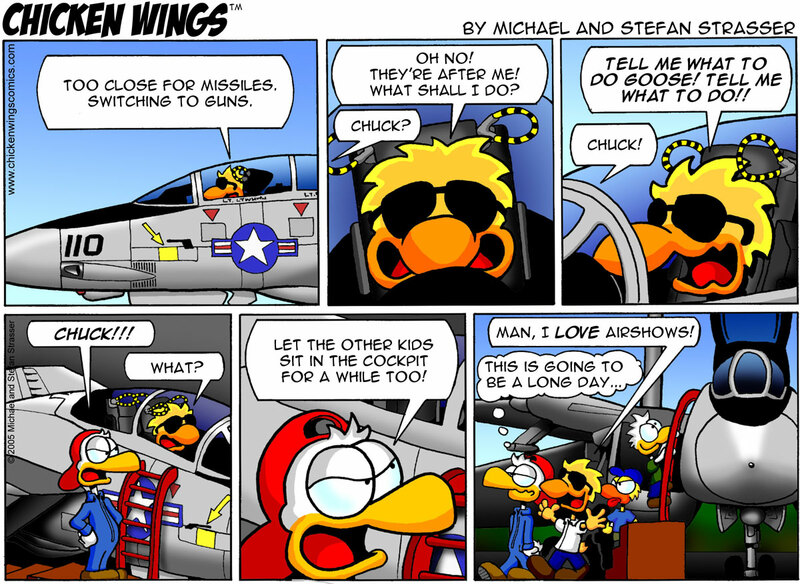 However, this comic is about F-14s. The first time I heard an F-14 while I was serving was while I was in a common area in the barracks. I ran to a window and saw if flying off to the airfield. It was soooo cool! It became obvious that F-14 pilots thought they were some real hot stuff. They ALWAYS ran their afterburners when they came in, and they ALWAYS flew over the enlisted barracks. Even at night. I’m sure it was quite a thrill to new guys, but it had worn old for some of us who had been in for a few years. The last time one flew over, I yelled at the pilot at the top of my lungs. It didn’t matter what I yelled. There was no way anyone could hear me over those afterburners. A lip reader might have been able to get me in trouble, but I don’t think there was one nearby. So, yeah. F-14s themselves are incredible planes, but enlisted Marines really didn’t care for the pilots after awhile. It doesn’t hurt my feelings that they are retired. There are a number at museums around the country, none flying. My local F-14D is practically in an airplane petting zoo. Really takes my breath away every time I get close to it. She has such perfect lines. Of course the security concern is Iran, but I don’t think they have any airworthy aircraft either. F-14 maintenance is not easy and the US hasn’t exactly been supporting their fleet. The last upgrade that Grumman provided was to disable the weapon systems. The Grissom Aeroplex Museum near Peru, IN, has an F-14B in “Red Rippers” (VFA-11, formerly VF-11) livery if you ever find yourself in Hoosierland. @Joshua: They do still fly them, and they jury-rigged HAWK sams as replacements for Phoenix. There is one exhibited on the USS Midway, which is an aircraft carrier now a museum (http://www.midway.org/). If you’re even in San Diego, go visit. They also have one Tomcat on the USS Lexington in the Gulf of Mexiko.